The Northern Tides territories consist of mainland Canada west of the Isthmus of Chignecto, the land bridge connecting the peninsula to the mainland. The easternmost territories of New Brunswick are included in the Northern Tides region. Although it is a trek for many canines of the peninsula to come to this area, more and more have been traveling to Freetown and other parts unknown for trading and other purposes. Climate: Although the climate of New Brunswick is maritime like Nova Scotia, it shares more similarities with mainland Canada. Winters are longer and colder, frequently accumulating more snow than the peninsula. Although the Northern Tides region experiences foggy days, the skies are generally clearer on this side of the bay. Geography: The Northern Tides region rather mountainous, possessing various peaks of typical Appalachian size. Glacial valleys are commonplace, lush forests nestled within. The coast here is dominated by the Bay of Fundy and its extreme tides; unique features such as raised beaches and sea stacks are commonplace. 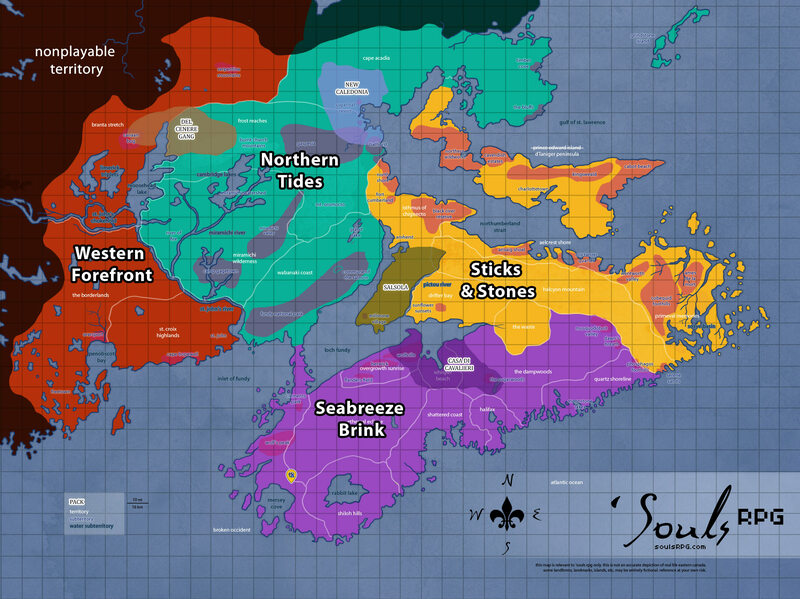 Demographics: The southern third of New Brunswick along the coast was the most populous before the apocalypse. Much of the human evidence elsewhere has faded with time; small villages hunker in vast forests. Most north-central farmland has already lost its battle with the wild overgrowth; the land almost appears untouched by humanity. Prey: Abundant, with the exception of the hilliest and roughest terrain of high altitude, particularly north of Mount Oromocto. Fauna: Many creatures found in this area are similar to those found on Nova Scotia. Unique to New Brunswick, however, are the Long Tailed and Gaspé Shrews, Big Brown Bat, Rock Vole, as well as both the Northern and Southern Bog Lemming. Flora: The underbrush of the rockier terrain consists of Alpine Bilberry and Mountain Cranberry, along with the Northern Blueberry. Tree species found in the mixed forests include Eastern White Pine, Northern Red Oak, Balsam Fir, and Black Ash, among others. General Areas Information: Basic information about our setting and how to navigate the neutral territory forums. Current Weather: Check out what it's like right now in 'Souls! Post Apocalypse @ RP Guide: A must-read for players interested in the apocalypse's effects on the world. Travel Guide @ RP Guide: Need help figuring out traveling times and distances? Check this out! 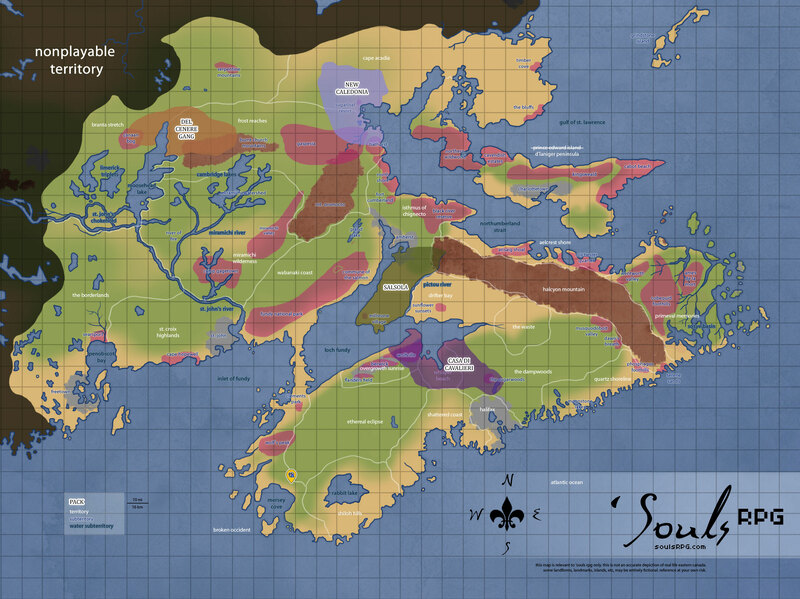 Areas @ 'Souls Wiki: The Wiki has various detailed information about the setting, including landmarks -- particular landforms, buildings, or other very small areas of note -- and past encounters in the area. Fauna: Find out what kinds of creatures your character is likely to encounter! Flora: Find out what kinds of plant life your character is likely to find! Maps -- A page housing a comprehensive list of all current maps relevant to 'Souls. Setting Questions? -- Check the FAQ! 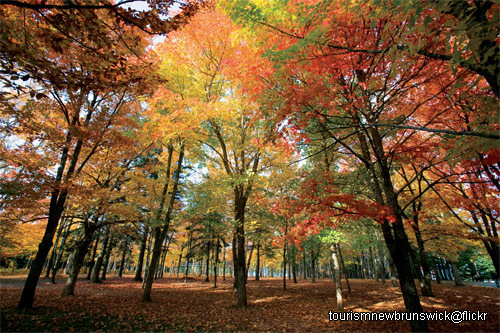 Much of the inner coast area of New Brunswick consists of lowland forest -- the Miramichi Wilderness is no exception. Most of the trees are broadleaf type; however, as the zone is a mixed forest, coniferous trees may be found here, as well. Sparsely populated prior to the demise of humanity, this thick forest sweeps down from Mount Oromocto and through the Miramichi Valley. The Wilderness is heavily pockmarked by various bodies of water: lagoons, lakes, ponds, rivers, creeks, streams, and all other manner of water bodies. The Miramichi Watershed is thickly forested land, just as its counterpart to the south, the Miramichi Valley. The difference between the two areas lies in the number of rivers: while the Valley has only one artery of water, the Watershed is home to a great number of rivers. They course through the low hills and burble in the dark, damp forests. Much of the rich soil here is damp and moist in summer, almost swamp-like. In winter, though, the whole of it freezes rock solid. 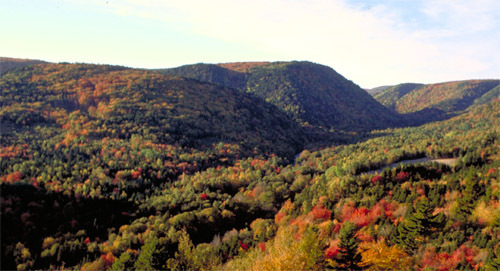 The shallow Miramichi Valley is situated next to Mount Oromocto; the Miramichi River, the valley's namesake, snakes through the valley. Much of the valley was untamed wilderness prior to humanity's destruction; while land was privately owned, few people chose to reside here, instead, most maintained gardens and firewood lots. A few human villages remain scattered in the southerly half of the valley; however, more evidence of people is slowly washed away with each year's spring. While most rivers freeze solid in winter, the springtime brings considerable flooding to the Miramichi Valley. This sprawling former First Nations community tucked into the rural reaches of New Brunswick was hardly notable during the time of humanity. Boasting only a few brick or stone buildings, it has mostly been reclaimed by wilderness. The clearest remaining evidence of humankind is the single-story, sprawling school building and the fire department building. Most of the land was formerly farmland -- though sapling trees have begun sprouting, there are few areas with thick forestation in this area. Camp Gagetown is a massive military base, operational until the human apocalypse. Camp Gagetown has a 1,129 km sq (436 sq mi) area -- it sprawls over the southern portion of the Miramichi Wilderness territory. Much of the terrain was landscaped significantly, as the military "designed" forests to create various training zones; additionally, in the early 1980s, strong herbicides were tested in the base's southern extremities. This particular patch of land is barren and very flat; nothing -- not even grass -- grows. These southerly "mudflats" are wide and the mud is very deep -- it is difficult for horses or canines to cross, and one is well-advised to avoid mess and other worse disaster by skirting the flats entirely. The coastal region on this side of the bay does not differ terribly from the Nova Scotian side; the tides are still ferociously strong, and the coastlands are subject to the whim of the sea. Much of the shore is extremely rocky and forbidding. The clearest difference between Nova Scotia and New Brunswick is the temperature: while the peninsula province's temperature is tempered by the surrounding water, New Brunswick's climate reflects that of mainland Canada. The winters are especially harsh, bringing snow and harsh cold to the Wabanaki Coast. During the time of humanity, those seeking to escape daily life frequented this park's trio of campgrounds, golf course, swimming pool, and of course, the vast number of hiking trails. Now, decades after the apocalypse, the golf course is overgrown and the campgrounds are eerie and deserted; many of the hiking trails have been swallowed by the forest. A vast array of animal and plant species dwell in this territory; fishing is an effective pursuit along the shoreline and in the park's numerous rivers and lakes. In the early 1980s, a group moved to the Fundy National Park without the government's permission. They were primitivists -- that is, they had a strong desire to live on the land and avoid the trappings of modern life. Their preoccupation with simple living did not save them from the virus, however, and they were exterminated as with the rest of humanity. Many chose to live in earth shelters -- e.g., homes built into the hillside itself. Much evidence of their existence has been reclaimed by the forest, although a single stone shack still stands. Additionally, a stone well sits beside the shack, drawing water from a deep underground aqueduct. Grand Lake is one of the larger lakes in the province. Its shores are dotted with the remnants of small villages of beach cottages, many of which depended on the fishing economy in the lake for sustenance. The northern shore is barren and bare, razed of trees during the time of humanity. Explanation for the peculiar baldness of the north coast lies with the sawmill also present on the same shore. Much of the machinery is damaged beyond repair, and many smaller outbuildings of the sawmill complex have completely collapsed. The Frost Reaches are the northernmost parts of 'Souls, consisting of the northern shore bordering the Northumberland strait. This area of the territory is starkly different from the southernmost reaches of Nova Scotia. The land has more in common with tundra and taiga. Consisting primarily of wind-swept forests and plains, the Frost Reaches are nonetheless prime territory for canines. Sparsely populated and consisting of tiny rural communities, this land was forest and prey dominated long before the demise of humanity. It has only flourished in the decades since. Mount Oromocto is the highest peak in the province of New Brunswick, dwarfing most of the Halcyon Mountains easily. The mountain is part of the Appalachian chain, and at its summit, a small fire-tower hut still stands, slowly falling into disrepair. Mount Oromocto is the source point for a few rivers and creeks, all of which snake slowly down its side, a few emptying into Grand Lake. There is a clear treeline about halfway up the mountain's face; past this treeline, the Mount Oromocto becomes bald rock and low, hardy shrubbery. Bathurst is a cool northerly community. 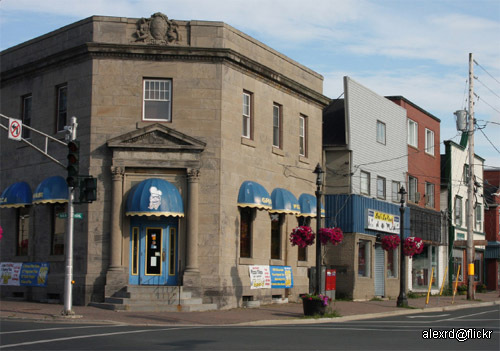 The small town is tucked against the Northumberland Strait; as a result, the area has relatively mild summers and very cold winters. Quaint buildings, influenced by the French, English, and First Nations human residents, stands in poor condition. Wooden structures have suffered more damage than stone, though weathering is apparent everywhere. One of the more interesting human legends surrounding Bathurst is the ghost ship. Almost two centuries have perpetuated the legend -- and somehow, it seems to have carried over to the Luperci. Perhaps this owes to the ghost ship paraphernalia, ranging from the town's welcome sign to two independent trinket shops. Gaspesia is a small piece of the larger Gaspe Peninsula that extends down into the Frost Reaches. 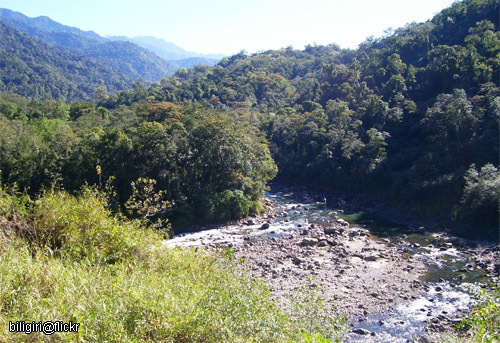 It is primarily low, rolling hills, dotted with both sparse and thick forest in places. The Burnt Church Mountains do not quite so much loom to the west, but they are generally visible in the thinly-treed areas in the eastern areas of Gaspesia. The area is home to a flourishing population of deer. Several small rivers and streams course through the area, inevitably emptying into the Northumberland Strait. The Burnt Chuch Mountains are a series of low-slung mountains in the northwestern extremes of the Frost Reaches. Though they are unimpressive in height and size, they are nonetheless an interesting feature of the land. Pockmarked by tors -- sudden rocky outcroppings on the mountain's surface -- they present a jagged appearance, altogether incongruous with their low, worn heights. Small icy streams winding through these mountains mark the beginnings of the small rivers that eventually join the Miramichi and flow out into the Bay of Fundy. Cape Acadia's territories are rocky and maritime, its shores rugged and curved along the salty coast. A multitude of jagged islands juts up from the shallow ocean close to the shores looking across Grindstone Island. To the west, the mainland transitions from rockbound terrain into soft curved hills of spruce and pine. To the west, not too far from the shore, the area becomes more mountainous, housing a long abandoned alpine ski resort and spread out winter vacation homes. An alpine ski resort rests on a mountain ridge in the north; a canine might find their eye drawn there by the line of an inoperable ski lift's poles reaching into the distance. The large ski lodge is mostly picked clean of valuables but provides warmth and shelter for wanderers, and no one can deny that the view from the cabin is beautiful! The slopes are no longer safe for skiing and mountain biking, littered with fallen trees and debris, but one can still walk the trails -- and they might come across the remains of an old alpine slide winding through the forest. Looking across to Grindstone Island is a peaceful cove set against the rocky sides of Cape Acadia. Hidden by a small and tenacious treeline, Timber Cove has long been a haulout and breeding site for a large colony of grey seals and smaller populations of harbor seals. Though they may seem docile or easy to hunt, a less cautious Luperci may find themselves in too deep if they have little experience with these pinnpeds! Enduring constant abuse from marine waves, the shoreline along the Gulf of St. Lawrence has eroded into a series of jagged cliffs jutting steeply out of the sea. Across from the mainland are a series of small, nondescript rock islands which provide a safe haven for migrating seabirds, such as Northern gannets, kittiwakes, black cormorants, silvery gulls, and puffins. Though vegetation is sparse and there is little prey to be found here, The Bluffs provide a view of the ocean that is second to none. Grindstone Island is an archipelago consisting of four unnamed islands. A quiet, lonely place, the island chain homes many sea birds and provides a suitable place for harp seals to raise their pups, but is otherwise inhabited by few other creatures. With its flat and somewhat barren landscape, outlined by stretches of sandy beaches and eroding sandstone, Grindstone Island may seem fairly useless. However, more adventurous Luperci may find use of the rock salt that can be mined here.